The upcoming release of Samsung's latest smartwatch, Gear S3, combines the power of fast-forward timepiece, elegant style and touch-friendly apps all in your wrist, making you get what you want and need in a matter of seconds. The perfect companion for your Samsung Galaxy phone. A breakthrough in technology, it’s an understated powerhouse wrapped around your wrist, brought to life for freedom to experience adventures to the fullest. It’s a busy world filled with energy and passion. Days are filled with an array of activities, with people always seeking fulfillment and achievement through hard work. Being the best version of themselves is a goal that everybody is working for; so is getting ahead in the game. But not everything has to be that hard. Samsung is a company known for their premium standard in technology. Constantly in the forefront of innovative ideas, they have been an ally of this competitive and ever-changing world with their mobile phones, tablets, and weareable devices that bring mobility and convenience to its users. They are now taking the world to an innovative new adventure, once again, with the Gear S3. This beautifully crafted piece of technology is deceivingly stylish; you can almost forget about the power and convenience that it houses. It’s the smartwatch that can you move with ease from one adventure to another; something you can effortlessly bring anywhere. Recreating the look and feel of a classic watch is a crisp 1.3” super AMOLED display with a customizable Always-On-Display mode surrounded by a 46mm stainless steel face. This is encapsulated in a water and dust-resistant glass and stainless steel rim, enabling you to carry it anywhere. It also features a Sunray Brush Finish, which takes out the problem of viewing in extreme light. Everything is made easy to navigate by the Rotating Bezel that gives the Gear S3 a unique personality. While Gear S3’s Frontier model is ruggedly handsome exuding excitement and energy, it also comes in a Classic design, which carries the minimalist simplicity and elegance of a vintage Swiss watch. You can also change the watchstraps with any 22mm band in order to fit your mood or taste. As much as the Gear S3 exudes class in design like a classic timepiece, it also boasts as much power inside more than any other smartwatch in the market. And while a smartwatch may sound complicated and intimidating, Samsung makes it easy for you. A unique touch but mostly an element that heightens convenience, the Gear S3 can be navigated with the innovative Rotating Bezel. Furthermore, beneath its aesthetics is a lineup of highly functional and convenient features. The Gear S3’s capabilities offer you standalone freedom. Equipped with built-in GPS, the Gear S3 helps you with location-tracking to keep track of your destinations. With the 4GB internal memory of the Gear S3, music savvies can now enjoy their playlist in as much convenience as checking the time. You can even play it out loud with its built-in speaker. Enjoy all these easily with a turn of the rotating bezel, and enjoy longer with a battery life that lasts for 3-4 days. Outdoorbuffs, on the other hand, can benefit from the built-in fitness tracker and sensors: barometer, altimeter, and speedometer. From running to mountain climbing, the Gear S3 collects your activity data and keeps you on track. It also alerts you of changes in atmospheric pressure, so you can keep an eye out for weather changes. To navigate through the timepiece, all it takes is a simple turn of the circular bezel. With more than 10,000 applications such as Uber and Spotify to choose from the Gear App Store, you’re now all set to conquer the globe! What does it take to be at the edge of the global frontier? For the passionate and successful individuals like you, it’s all about going forward and reaching heights farther than imagined. May it be personal or professional achievements, the goal is always to be better than the best. 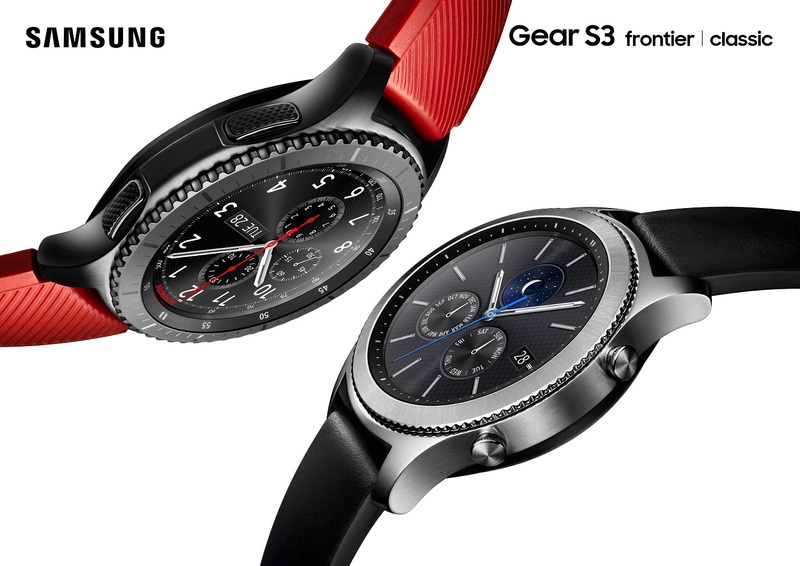 As a brand that enables you to move forward by defying barriers, Samsung created a masterpiece inspired by your passion to move forward, a masterpiece that will complement your lifestyle and fuel your drive to reach one milestone after another –thus the Gear S3 is born. Complementing your go-getter lifestyle with its classic design, giving you standalone freedom to let you move forward without strings to hold you back, and equipped to become your adventure companion, the Gear S3 is no doubt the smartwatch for you. So what are you waiting for? Choose from two models –Frontier and Classic - for PHP16,490. The Gear S3 will be available in stores nationwide starting January 21, 2016. Check out www.samsung.com/ph/wearables/gear-s3/ for more details.